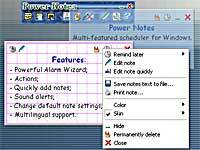 Power Notes is a simple organizer, reminder and scheduler for your home and office allowing you to create electronic stickers and display them when the time is due. Power Notes is a multi-featured scheduler / reminder / organizer for Windows allowing you to create electronic stickers and display them when the time is due. The program is very easy to use and has low system requirements. The scheduler stays in the tray and does not interfere with your activities. If necessary, it can be displayed as a small toolbar on the desktop. All the parameters you may need to change are customizable: a sticker can be of any size, it can have any color scheme (which can be useful, for example, to tell between stickers on different topics) and you can use various skins for stickers. We also implemented sound schemes to accompany the display of stickers. Together with the wizard for creating stickers, it is possible to edit them either quickly or in the advanced mode. The program allows you to specify the date any time of a reminder in every detail with the help of "Alarm Wizard" (it is possible to set the start and stop time of displaying, set it at certain time intervals, on certain dates, etc.). Along with actually displaying stickers, the scheduler can launch programs and files, open pages in your web browser. The program also supports a multilingual interface. GoldenSection Notes - User-friendly e-notebook that organizes your notes in a folder tree format ! 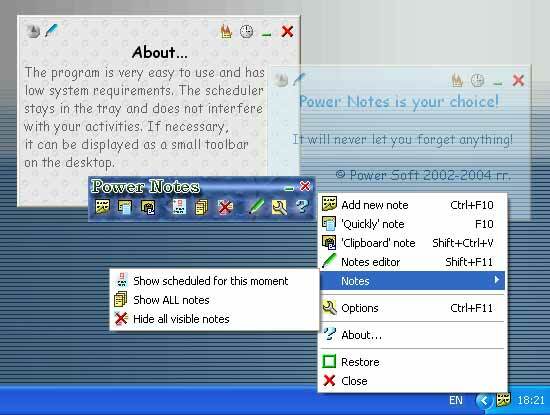 Desktop Notes - a program that will allow you to post notes on your Windows desktop.